If you want to know what L-theanine is and how it can benefit your health and mental and physical performance, then you want to read this article. We humans have been drinking tea for thousands of years and, thanks to modern science, we now have a better understanding of why this simple beverage has survived the ages. Namely, studies show that tea contains several molecules that help prevent disease, enhance mood and cognitive function, reduce feelings of stress, prevent weight gain, and more. It’s simply one of the healthiest beverages you can drink. The molecules most responsible for tea’s benefits are caffeine, which we all know and love, polyphenols, which are substances that plants produce to protect themselves against radiation and various disease-causing microorganisms, and the star of this article: L-theanine. L-theanine was discovered in 1949 and is finally getting the limelight it deserves, and in this article, you’ll find out why. By the end, you’re going to know what L-theanine is, why people supplement with it, how it can benefit you, how much you have to take to see those benefits, what its side effects are, and more. Why Do People Supplement With L-Theanine? What is the Clinically Effective Dose of L-Theanine? What Types of Results Should I Expect From Taking L-Theanine? Does L-Theanine Have Any Side Effects? What's your take on L-theanine? Have anything else to share? Let me know in the comments below! L-theanine is a non-dietary amino acid, which means it’s rarely found in the foods we eat and it’s not essential to human life. The “L-” refers to the structure of the amino acid and denotes that it can be used to create proteins (the other type of amino acid is the “D-” form, which are found in cells but not in proteins). L-theanine is structurally similar to the amino acid L-glutamine and can cross the blood-brain barrier, which means it’s able to affect brain chemistry and function. It’s found exclusively in tea and some fungi but only in small amounts, which is why it has become a popular supplement. The main reason people supplement with L-theanine is to promote relaxation and improve attention and focus. Unlike other relaxing agents such as lemon balm, L-theanine doesn’t tend to cause sleepiness and so isn’t classified as a sedative. This interesting combination of benefits makes L-theanine particularly beneficial for taking the edge off other stimulants like caffeine, which we’ll talk more about in a minute. L-theanine can benefit you in more ways that many people realize, including your physical and mental health and cognitive and exercise performance. For example, research shows that L-theanine enhances the effectiveness of drugs that treat tumors, lowers the risk of developing diabetes and heart disease, reduces high blood pressure, improves sleep quality, and boosts the immune system. In terms of mental benefits,studies show that L-theanine can protect against nerve damage and cognitive dysfunction, reduce anxiety and depression, and improve memory and learning ability. It can even boost exercise performance by improving blood flow and reducing fatigue. Let’s take a closer look at how L-theanine is able to do all of this. L-theanine lowers levels of oxidative stress in the body, which in turn enhances the effectiveness of anticancer drugs and helps mitigate the side effects associated with some of the drugs. Oxidative stress is an imbalance between the body’s production of harmful free radicals and its ability to counteract their effects. Diabetes is a disease wherein the body is unable to process glucose (blood sugar) properly. Research shows that supplementing with both L-theanine and zinc helps reduce blood sugar levels, making it a valuable supplement for people with a family history of diabetes. Heart disease is the number one killer in the world, so it behooves us to do everything we can to keep our tickers healthy. L-theanine helps us do this by lowering cholesterol levels and increasing the production of nitric oxide, which is a gas that widens blood vessels and improves blood flow. L-theanine is able to prevent the amino acid L-glutamic acid from binding to receptors in the brain, and this helps reduce anxiety and high blood pressure. High blood pressure is also a risk factor for heart disease, so this mechanism adds to L-theanine’s cardioprotective effects. As I mentioned earlier, L-theanine is able to cross the blood-brain barrier. This allows it to influence the activity of various neurotransmitters, which are the chemical messengers in the brain. Despite not having any inherent sedative properties, L-theanine has been shown to improve sleep quality. It appears to be effective in improving both sleep efficiency (the ratio of time asleep to total time in bed) and reducing movement during the night (less tossing and turning). Research shows that L-theanine helps your body produce glutathione, which is an important antioxidant that protects against disease and dysfunction. Glutathione levels tend to decrease with age, making L-theanine particularly beneficial in warding off age-related immune system decline. We recall that L-theanine reduces oxidative stress in the body and improves brain function, which explains why studies show it can increase the speed with which you can complete mental tasks and as well as reduce the amount of mistakes that you make. Furthermore, L-theanine stimulates the production of the neurotransmitter dopamine, which improves attentional and memory function. L-theanine’s physical performance benefits are owing to its positive effects in the brain as well as its ability to increase the concentration of glycogen in the liver, which is used as fuel when you work out. It also increases nitric oxide production, which in turn improves blood flow and oxygen delivery to your muscles. This is why you’ll find theanine in combination with caffeine in some pre-workout supplements. Studies show that L-theanine can lower the heart rate and other physiological responses to stress, making it an effective anxiolytic. Its antidepressive effects occur as a result of how it influences neurotransmitter activities, which elevates mood and overall sense of well-being. I mentioned earlier that caffeine and L-theanine have a special relationship. Studies show that they have a synergistic relationship, meaning they enhance each other’s effects. If you like caffeine, then you’re going to love it with L-theanine. The clinically effective dose of a substance is the amount that produces the desired response or effects. In the case of L-theanine, it works in a dose-dependent manner, which means that the more you take, the more benefits you’ll see (up to a point, of course). That said, the benefits we’re after are seen in the range of 100 to 200 mg of L-theanine per day. It’s also worth noting that, in animal research, L-theanine appears to be remarkably safe as very high doses have failed to cause toxicity. If you’re excited about L-theanine, I understand. That said, it’s not a miracle molecule. Unlike most supplements, no side effects have been reported for L-theanine since its widespread use started in 1964, even when taken in high quantities. Moreover, there are no known interactions of theanine with prescription medications or over the counter drugs. That said, it’s advisable to check with your doctor before supplementing with L-theanine if you’re taking any medications. You now know why L-theanine is extremely popular and found in some pre-workout supplements. No amount of pills and powders is going to make you lean and healthy. The good news, though, is if you eat right and exercise regularly, then certain supplements can help you get more for your time and effort. For example, an effective fat loss supplementation regimen can increase fat loss by about 30 to 50% with little to no side effects. And in the case of L-theanine, it can boost your physical and mental health and exercise cognitive performance with no side effects. If you work out, caffeine is good for more than the energy boost. It also increases muscle endurance and strength and, as you now know, works synergistically with L-theanine to further enhance energy levels and mood. Citrulline is an amino acid that improves muscle endurance, relieves muscle soreness, and improves aerobic performance. Betaine is a compound found in plants like beets that improves muscle endurance, increases strength, and increases human growth hormone and insulin-like growth factor 1 production while exercising. Ornithine is an amino acid found in high amounts in dairy and meat that reduces fatigue in prolonged exercise and promotes lipid oxidation (the burning of fat for energy as opposed to carbs or glycogen). 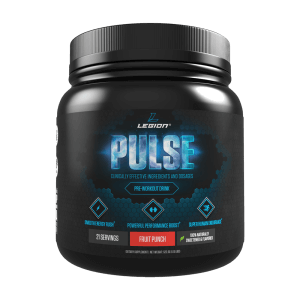 The bottom line is if you want a pre-workout supplement that not only gives you a smooth energy rush, but actually improves your performance both in the weight room and on the field, then you want to try PULSE. More and more people are supplementing with L-theanine these days, and for good reason. Numerous scientific studies have confirmed that it can reduce the risk of disease, lower stress levels, improve physical and cognitive performance, and reduce feelings of depression and anxiety. It also works synergistically with caffeine to give you a smoother energy rush with no crash and further elevate mood and mental performance. It’s not going to change your life, of course, but L-theanine will help you be mentally sharper, feel better, and stay healthy. What’s your take on L-theanine? Have anything else to share? Let me know in the comments below!